Today is the feast of St Nicholas!! Here is a lovely icon depicting events in the life of St Nick. Sorry I haven’t been present on the blog for a couple of months. I have moved house and also moved into my new role as Vicar of Mixenden and Illingworth in North Halifax. Needless to say it has been a busy time so there has been little in the way of opportunity to share my banality with you all. This has been coupled with a 2 month break from the internet as we were unable to get connected until this week! You can expect normal service to be resumed over the course of the coming week. 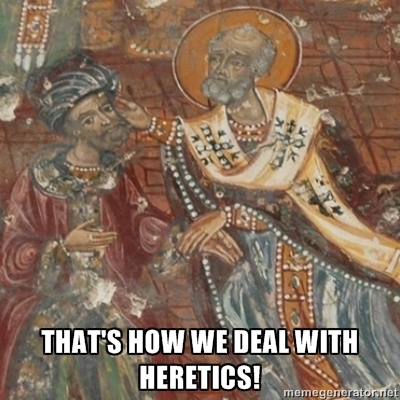 And if you would like to play about with a meme where one present distribution based Bishop slaps another heretic based Bishop, click here.